At Shearwater we recognise the very specific needs and often time restrictive requirements of our oil and gas and offshore customers. As a result our management team takes a logistics approach to supporting oil and gas industries by ensuring that at least one of our IMCA compliant dive containers is immediately available for deployment to any location in the world. We understand the need for a reliable and compliant diving service that utilises high quality equipment and qualified competent diving personnel. Our equipment is maintained to manufacturers and IMCA D018 standards, and our diving personnel are experienced and well used to working in often difficult and hostile environments. Our company appreciates that health, safety and productivity are at the centre of every upstream and downstream operation and we support our customer by performing at optimum levels with regards to dive team size and shift periods to ensure that works are completed in a timely, effective manner, with minimal impact on production. 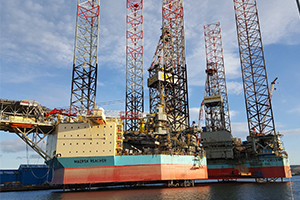 Recent project successes have included supporting works on the Total operated Laggan and Tormore north-west off the Shetland Islands and jack-up platform support at Invergordon on the Cromarty Firth.